Freedom From Arthritis Through Nutrition, by Dr. Philip Welsh, Bianca Leonardo. Where was Jesus and what was he doing from ages 12-30? Why does the Bible leave out this important information? Is there any truth to the myths and legends that proclaim that Jesus visited many other countries? This book contains amazing accounts of Jesus' missing years based on an old manuscript that was found by the author in a Tibetan lamasery in the 1890's. You will read about the author's dangerous journey to Tibet as you uncover the mystery of the "lost years" of Jesus' life. Complete with maps, commentaries, and references. Oversized, 8 1/2" X 11". "A dark age began, a time of savagery, of barbarism, of book-burning, of superstition and worship of empty idols. The gentle Jesus was lost forever in the image of a crucified God; the Essene brothers hid their teachings in the minds of the few who could preserve them for their descendants, and the Scrolls of Healing lay neglected beneath the shifting shadows of the desert..."
Who, in fact, were the ancient Essenes? What secret doctrines did they uphold? Why did they keep their practices hidden? How do these writings relate to Jesus and His teachings? This vital book explores the pre-Christian origins of New Testament writings and the little-known mysteries of the ancient Hebrew sect called the Essenes. It explains their SEVEN DEVOUT PRACTICES. New evidence is presented refuting the accusations blaming the Jews for the crucifixion of Jesus. 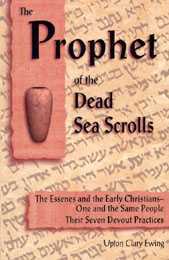 The author shows you why and how "The Sect of the Scrolls", the Nazarenes, the Ebionites, and the Palestine Christians were one and the same people. New Titles Now in Stock. 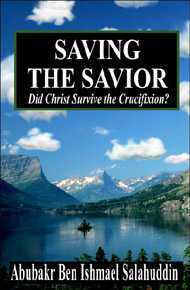 SAVING THE SAVIOR: Did Christ Survive the Crucifixion? was rescued from the Cross and lived out a long life in Kashmir. Read Amazon Reviews of Saving the Savior. Meet a self-made man who lived a totally unselfish life, and who opened doors of opportunity for untold millions through his philosophy that "ALL GOOD THINGS ARE POSSIBLE!" He believed that each of us is placed here on earth for one main purpose--to help others. Conwell was a minister, the founder of Temple University, and two hospitals where no one was ever turned away for lack of money. He was also a famous lecturer. In his lecture, the story is told of a man who sells his farm, to travel far and wide in search of diamonds. There is a moral to the tale Conwell gave the lecture over 6,000 times to untold numbers of people. It earned over $4,000,000 (about $150,000,000 in today's dollars) all given to youth and education. "ACRES OF DIAMONDS" is a spiritual book. It is not a "get-rich-quick" guide. Conwell saw that success is a spiritual idea, and is a result of spiritual principles. The 160-page book includes the lecture and biographical material. Here is the original self-motivational message, long lost, now found! You, too, can find your fortune -- if you know where to look. 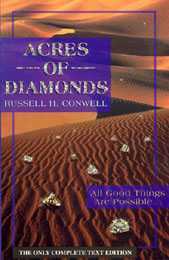 Let the author point you in the right direction to find your "Acres of Diamonds." There are many opportunities for success today as in Conwell's time, if not more so, because they are found first and foremost in one's own conscience. Here is a real "must-have" in inspirational books! The ONLY COMPLETE TEXT EDITION. You will greatly enjoy each of these heart warming, true stories, involving the special power of extrasensory perception in animals. They are also about a bond of trust that can exist between people and animals of all kinds. These thoughtful tales demonstrate how the author spoke silently with all forms of life and how he grew to understand their silent replies. The author believes that this silent language can be learned; reading this book helps us cultivate a gentle, reverent attitude toward all life. 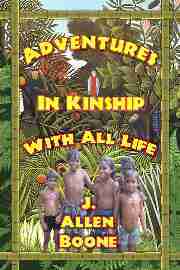 This book salutes the divinity within all living creatures and opens up a wonderful new world of silent communication for you to explore. 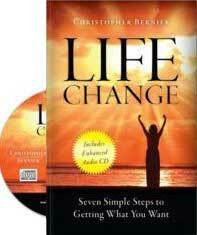 Life Change: Seven Simple Steps to Getting What You Want. Life Change is a powerful motivational tool - with a book, CD and forms - to bring your thoughts and actions into alignment with your goals, helping you achieve them. By Christopher Bernier. An Incredible Life .... a Tragic Death! AMERICA'S FIRST FEMINIST, FEMALE MINISTER, AND MARTYR. True, Dramatic, Inspiring! If Anne had been a man, she'd be in all the history books. 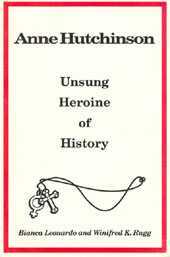 Her exciting story has been almost forgotten for 350 years! Anne came to America from a comfortable life in England, to settle in rugged, four-year-old Boston. The conditions were extremely harsh. The women, with constant child-bearing, suffered the most. Spiritually minded, loving Anne became involved in helping the women in the Colony understand "the God of Love, not Law." Anne's zeal for God's truth in an all-male clergy led to an outright inquisition, and, ultimately, to her excommunication and banishment. Soon thereafter, came her tragic and untimely death, along with her young children. This Founding Father attributed all his success to this character-building plan that he started in childhood, on his own initiative. He got the idea by reading the ancient Greek philosopher, Pythagoras. Editor Bianca Leonardo spent two years in creating this work, and traveled to Philadelphia and Washington, DC, to locate historical art for it. 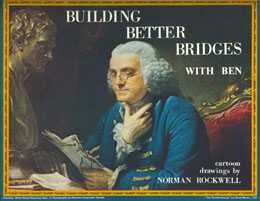 Includes Ben Franklin's rebus (puzzle) "The Art of Making Money Plenty," many illustrations and cartoon drawings by Norman Rockwell. The cover picture comes from a painting that hangs inside the White House. Deluxe, 9" X 12", spiral binding, four color covers. Of special interest to parents and teachers. Additional copies, $3 each. Teacher's manual, "Building Better Bridges with Ben" to accompany Ben's Success Plan: $3 each. Cancer is the Number Two cause of death in the U.S. A new edition of the "Grape Cure," widely used by holistic health professionals in many countries to fight disease, often in patients with "inoperable cancer." Grapes contain a very powerful antioxidant that protects your body cells from "free radicals." Scientists have given it the name of "proanthocyanidin," but it is not new. As far back as 1556, books on this wonderful nature cure had been published in various European languages. Dr. Brandt was diagnosed with cancer in 1916, shortly after her mother died from cancer. Working with her own diet, fasting, etc., she began to see the relationship of the food she ate to the progression or regression of her cancer. It took nine years to achieve her healing. She discovered that a meat diet perpetuates cancer, a vegetarian diet conquers it, and that organic grapes aid healing. She helped others rid themselves of this deadly disease, left her native South Africa to bring her discovery to the U.S., and wrote this book. She shares her journey back to wellness in this small, yet remarkable book, reprinted because "the need is greater than ever for natural discoveries to reach the people." 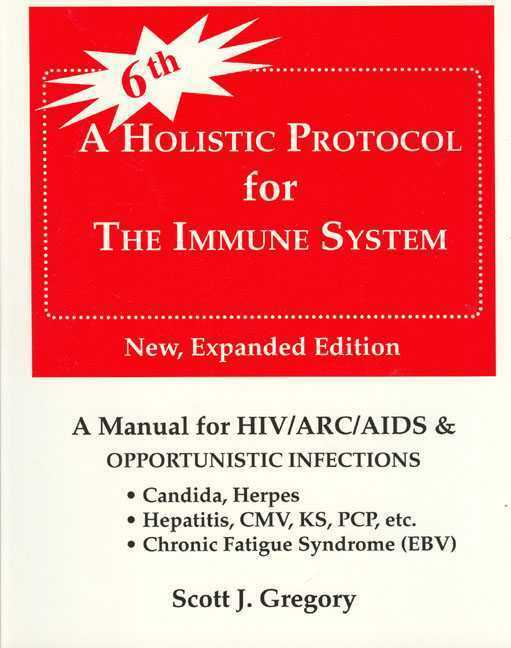 The only 4-phase, holistic protocol in print that makes it possible for one to be in control of his/her own immune system. For those who wish to follow holistic methods, this highly effective protocol, developed by Scott Gregory, uses the latest nutritional advances and natural techniques, designed to develop and strengthen a successful wellness program. Completely non-invasive, non-drug, holistic, all-natural medicine. Specific protocols are given for: Candida, Epstein-Barr, Herpes, HIV/ARC/AIDS, Cytomegalovirus, Hepatitis, and other infections. Contains new supplement information, charts, references, sources. by Philip J. Welsh, D.D.S., N.D. and Bianca Leonardo, N.D. 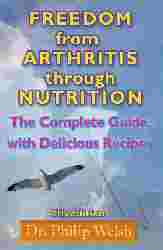 Reveals the results of 60 years of research on arthritis by noted nutritionist, Dr. Philip J. Welsh, D.D.S. N.D. Here you will find simple, natural, inexpensive, tested ways of coping with the various forms of arthritis, using only nutrition and other natural methods. There are no drugs or gadgets in this program. During his many years of research, Dr. Welsh tested his findings to insure their practicality and benefits. 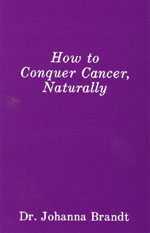 Since this revolutionary book first came out in the 1970's, many thousands of people have been helped by it. In this unique health manual, you will have the complete, simple, step-by-step Diet Plan. You will learn which non-foods (like "The Three Bad Whites") to eliminate from your diet and also which foods you need to add. Dr. Philip Welsh's revolutionary discovery about the role of nutrition in arthritis---not an incidental role but the principal one---is an idea whose time has come. Readers of this manual can help themselves. They need not wait fifty years for the medical profession to catch up. Testimonies from some of the thousands helped. "The New Four Food Groups" ... "About Cholesterol"
"Longevity without Senility" ... "The Natural Way to Treat Constipation"
"Books that Heal and Inspire." She has 25 years' experience as author, editor, and publisher. In addition to her own books, she edited and proofread books for authors, under the name "Leonardo Literary Services." Ms. Leonardo has an N.D. degree (Doctor of Naturopathy) and a Ph.D. in English. During WW II, she served in the U.S. Army as a writer for the famous "Yank" magazine and "Stars and Stripes" newspaper. Other interests are: the vegetarian diet (she was founder and president of a vegetarian society in the Los Angeles area for ten years), and the Essene teachings. She is a visiting minister of the Essene Church in Oregon. Ms. Leonardo retired in 2001, and the publishing business is being carried forward by her son, John-Paul Leonard. "A book is the only gift you can open more than once"
Shipping and handling within USA: Priority mail: $6.00 first two items, $2 each additional item. By USPS book rate: $3.00 first item, $1 each additional item. If you have a Special discount, or wish to place any other kind of special order, please use the Special Order Message Option - or contact us. With so many books, she knew not what to do. With old books and new -- this place is a zoo!